The last day of Medvedev's presidency also became the last day in office for navy chief Vladimir Vysotsky. By the presidential decree, Baltic Fleet Commander Vice Admiral Viktor Chirkov was appointed the new Russian Navy Commander-in-Chief. Symbolically, Chirkov's first day in the new office coincided with that of the new president, Vladimir Putin. Staff changes also touched Russian Air Force. 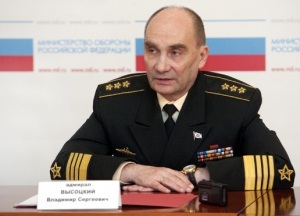 By the same decree, the ex-president appointed Major General Viktor Bondarev Russian Air Force Commander. His predecessor Alexander Zelin was retired late in April and became Medvedev's advisor. Defense ministry earlier announced that Zelin would take a position of the minister's adviser on aviation development. Zelin was appointed Russian Air Force Commander in May 2007, while Admiral Vysotsky got to the top of Russian Navy later on that year, on September 12. Both commanders held their offices for a pretty long period, somewhat 5 years, just at the time when the military reform and building of "the New Look Army" reached the apogee. Medvedev has recently made other staff replacements in defense ministry. Those changes were primarily related to army generalship. Deputy Chief of General Staff, Colonel General Valery Gerasimov was appointed Central Military District Commander. His foregoer General Colonel Vladimir Chirkin was promoted to Russian Ground Forces Commander. Ex-commander of Siberian Military District and then Ground Forces Commander, Colonel General Alexander Postnikov took the office of Deputy Chief of General Staff. Some media sources say that is he who can be the candidate for the Chief of General Staff's chair. It has been talked about Vysotsky's coming ouster for a long time, and in the recent month talks became almost open. Some high-ranking shipbuilders even forecasted his dismissal saying it would happen right after Putin's inauguration. However, the decree was signed by the outgoing president. So far, there is no information about further career of Vladimir Vysotsky. The only thing is clear that he has not been retired yet. It is rumored that he was offered to become Deputy Chief of General Staff or head the General Staff Military Academy. But it's only gossip though. By the way, Admiral Vysotsky was seen among other statesmen at Putin's inauguration ceremony which is quite meaningful. What is the use of such replacements in naval leadership? According to some experts, Vysotsky did oppose apologists of the military reform including Chief of General Staff Nikolai Makarov. Vysotsky criticized General Staff's plans to deprive Navy from traditional status of a separate branch. Russian Navy was seriously disrated back in 2010 when all three fleets based in domestic waters as well as Caspian Flotilla were attached to strategic commands named military districts. Northern and Baltic fleets joined Western Military District, Caspian Flotilla was handed over to Southern Military District, and Pacific Fleet – to Eastern Military District. Array of problems regarding subordination and management came up and are still urgent. However, this by no means embarrasses higher military leaders believing all reforms imply difficulties. Essentially, Navy command is no longer a military authority but an administrative agency executing merely technical, diplomatic, and scientific functions. Being the central control agency, Navy Main HQ fell under optimization. Staff and functions were reduced to the minimum. In 2011, there was even speculation about disbandment of Navy Main HQ and establishment of a Navy Department within General Staff. However, Russian Navy Main HQ still functions and there is no official reports on its downgrading. Nonetheless, there is no evidence of Vysotsky's notorious "opposition nature" either. What comes to mind in this context is the affair of coming transfer of Navy Main HQ to St. Petersburg. Contrary to belief that the admiral actively resisted that decision, Vysotsky has never disputed it. He only opposed urgency of the transfer standing for the move to prepared premises in order to keep control over naval forces every minute. One may find both positive and negative events happened in the Navy under command of Vladimir Vysotsky. Among positive changes was return of naval task groups to high seas, for one, the recent deployment of aircraft-carrying cruiser Admiral Kuznetsov off Syria. Interfleet cooperation revived under command of Admiral V. Vysotsky, for example, Northern Fleet's cruiser Petr Veliky and Black Sea Fleet's flagship Moskva took part in Pacific Fleet exercise (Petr Veliky was visited by president Medvedev then). That did not pass unnoticed by our oversea partners from the US, they came to conclusion that Russian Navy was indeed back again. The prospective shipbuilding development concept was shaped and is being implemented. Requirements for reliability and construction rate of ships have risen. Sure, the Navy's policy in this matter is controversial, but some encouraging results have been really achieved. Among those worth mentioning are improved relations with Ukraine over the Black Sea Fleet deployment issue, and wide participation of Russian Navy's ships in different international exercises. Our naval forces have been successfully attending international anti-piracy campaign near Africa for many years now. Speaking of negative sides, what comes to mind is a number of accidents, sometimes with casualties – fire at Navy depots near Moscow (resulted in Vysotsky receiving service incompetence note from the president); fire and explosions at Navy arsenal in Ulyanovsk; tragedy on nuclear submarine Nerpa; fire on SSBN Yekaterinburg at the turn of 2011. What can we expect from the new Navy Commander-in-Chief? As for Chirkov's colleagues, he is an experienced and thoughtful officer well aware of responsibility for the Navy's combat worthiness. Hopefully, he would pursue the development course laid by his predecessor, both organizationally and regarding shipbuilding prospects. 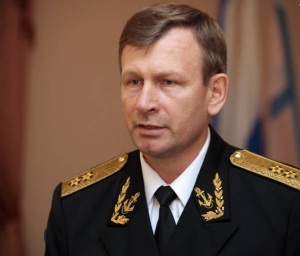 Making only one statement about his plans on the new position, Vice Admiral Chirkov said that "the main thing for Russia is to build the Navy with support of the president and associates". And that can only mean that Russia will strive to remain one of the leading sea powers which contemporary history was made not least at shipyards and captain's bridges.